The KONG Cat - Kitten Pom Tail Mouse stimulates your kitten's hunting instinct. This mouse swings in all directions when your cat starts playing with it. 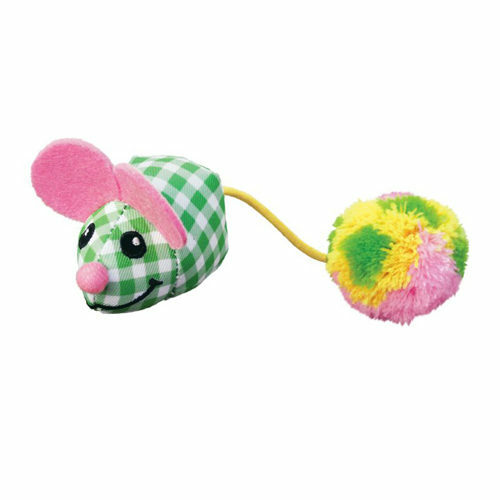 The rattling noise and soft pompom tail create even more action. Catnip has been added to keep your cat interested. The Kitten Pom Tail Mouse from KONG Cat ensures hours of playing fun! This toy in the shape of a mouse has a fluffy pom tail that won't fail to get your kitten's attention. When playing, the toy makes a rattling noise, further encouraging your young cat's hunting behaviour. In order to keep the game going for longer, a healthy dose of catnip has been added. Pink or green. This product is delivered in random colours, making it impossible to choose a colour. Have you used KONG Cat - Kitten Pom Tail Mouse before? Let us know what you think about this product.